FoodThoughtsOfaChefWannabe: (CLOSED) New Years Giveaway....Keep On Baking! 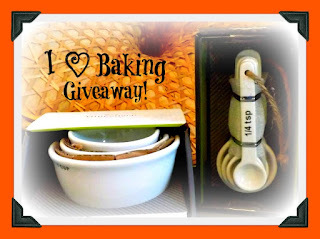 (CLOSED) New Years Giveaway....Keep On Baking! Can you believe it is 2013 already? Must husband and I were talking about what we thought it would be like when we were kids. He was sure we would be flying around with jet packs by now! I never really thought about it but I thought it would be like the Jetsons kind of. We couldn't have been more wrong eh? Even though we are jet pack less, and hover car less, I am pretty grateful for what we have! This year has been just incredible for FoodThoughtsOfaChefWannabe. 10,000 fans in the last 12 months on Facebook and 274 fans here. (lets grow this number, can we?). I appeared in Penzey's Spices with 2 original recipes and a story about being a mom, and my parents. I was recently published on Fox News Online Magazine as well. Even though I haven't mentioned yet, I also have gone to a self hosted domain. You can find me now at www.foodthoughtsofachefannabe.com. I am a "dot com"!!! These little things in life excite me in ways even I don't understand. One thing I do understand is how important each of you have made this journey. Your support, your friendship, your input, your jokes, laughter, faith and humanity are all gifts you share with me. I am eternally grateful. As most of you know I always say I am a terrible baker. I have spent the last year working hard to bake better. I have to have a few things to get in the baking mood, good LOUD music, chocolate, and fun kitchen tools! You may or may not remember how excited I was to get my porcelain measuring spoons and then I got the Curtis Stone glass measuring cups. Have you SEEN Curtis Stone? I will be anything that hottie wants to sell me, INCLUDING measuring cups. I had to justify 30.00 measuring cups, so I promised my hubs I would learn to bake better. It is working so far...thank you Curtis, my lovey, I LOVE BAKING! Hopefully some new fun kitchen tools AND a little Curtis in your life will help YOU love to bake even more than maybe you already do!! Anyway the point is, I decided to find some glass measuring stuff for you all. I found you these great ones! You will get the spoons and measuring cups/bowls. I picked up 2 sets, so there will be 2 winners! I wasn't to learn to make breads better. I like to experiment with new recipes and ingredients in the kitchen. HungryLiitleGirl, that describes my house! I love baking. I am always trying to find new recipes and love your site. Living on a farm in the middle of nowhere, ive learned more about natural products. I try to bake in between my kids naps and their bed times and any other time they are distracted and I make a mess, but the result is usually yummy. I'm not a great baker either, but I'm getting there! I'm more of a soup/sauce person. I am a messy cook/baker and use just about every dish in my kitchen to make things. I love this. I love to bake and try new recipes that my Pastry Chef daughter sends me. It is would be great!!! I am possibly the WORST pie crust maker in the universe! We have Sunday family dinner where my sister and I switch off taking turns to cook for 8 of us and I've tried twice to make homemade pie crust resulting in EPIC FAIL! LOL! For New Years Eve, I resorted to paying a local home baker to make me a couple of pies for the annual get together with the folks. Little kitchen, not much room, and I seem to be in a rut of about 12 suppers. I have a small kitchen, so I am a creative cook. And Perri referred me over! I want my kids in the kitchen more to help me bake! I love to cook and bake and my young grandchildren are noe interested in learning I just wished they lived closer. Thanks for the great blog! I love to cook...I am working on my baking skills. LOL! I love to cook in the kitchen, the smell of food cooking makes me happy. I love cooking knowing that my family will eat it, and it will fill them up. I use almost every measuring spoon and cup (never enough) when I bake and cook...and my kitchen is always a mess when I'm done!! I am an artist in the kitchen, and create my own spice blends to bring out all the perfect flavors in my dishes. As long as I have a recipe to follow, I'm a great cook & baker. I love to bake, anything and everything. I just hate to clean up after myself! Focused on the task at hand! I love to be adaptable and creative in the kitchen! I love to cook and particularly bake! It's always been my passion! I just happened upon your Facebook page today and followed the link to here. I saw so many wonderful recipes I'm dying to try! Congratulations on your accomplishments so far and good luck for the future! I am an RV cook who's taking a culinary trip around the world from my galley. The kitchen is my hang-out pretty much. It looks like a science lab with all the mixing and experimenting.... LOL! I love to bake, the smell of things baking in the oven or cooking on the stove are just wonderful. I am learning a lot from your blog. I have also learned a lot from watching Curtis Stone. I am a FoodNetwork and Cooking Show junkie...LOL.